If you want to play your music or other audio on an Android device from your PC, then SoundWire Server is probably one of your only choices. This program acts as a server with your Android-powered phone or tablet acts as a client for receiving audio that's being played. 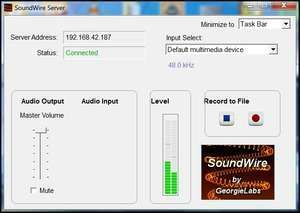 SoundWire Server will install itself as an audio device on a Windows PC and stream over a local area network. Setup of this program isn't too difficult. For security reasons, you should also check out the SoundWire Server download at LO4D.com which includes virus and malware tests. Additional screenshots of this application download may be available, too.